Currency can be worthless in a week, let alone a year. Stupid coin. Ya, I saw the same thing happen with BURST. Very innovative coin (mines with HDD space vs typical PoW or PoS). It actually beat Ethereum to being able to use and execute smart contracts, but few knew of it because of very poor advertising. I can not use it for mine. 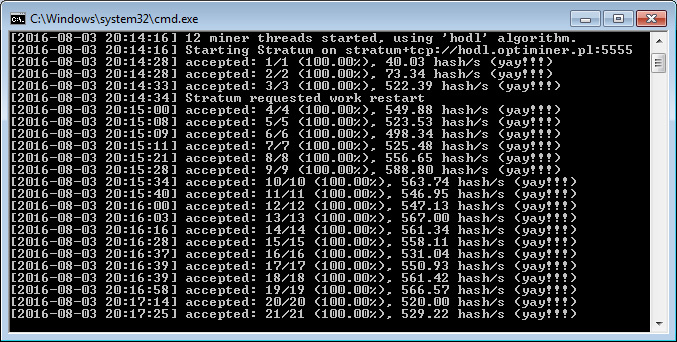 It shows that “Stratum requested work restart”. How can I get it work in the right way? My cpu is 6700k . I can find it in the list. Butit can not work. why? 6700k can not uses hodlminer-optiminer-fork? I hope they add solo mining to this new miner. I don’t trust the idea of using a pool with a year wait. If anything like that changes, please be sure to create a post about it!